Historical Options Data a la carte! ___________ Options Data Mine provides users access to EOD Historical Stock Options data for the years 2010, 2011, 2012, 2013, 2014, 2015, 2016 to present. Options data is available in CSV. format or displayed on screen. Data is available for individual stocks or bulk orders. No membership fee required to access historical options data. Options Data Mine provides registered members of the most notable options activity along with tracking tools and historical data. ____________ Hundreds of millions of dollars trade hands weekly in the stock options market open Monday - Friday 9:30AM - 4:00PM EST. Publicly traded Companies like Google (GOOG) see exhibit1 along with thousands of well know publicly traded companies deliver impressive price swings day to day. 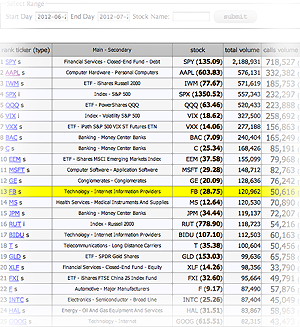 Historical stock options data can be found at optionsdatamine. Week to week hundreds of option contracts repeatedly fluctuate 1,000% within days! These price swings are now exposed and can studied at Options Data Mine! ____________ Stock options prices fluctuate wildly due to parent stocks behavior. A profitable move in the parent stock, will create a large price movement in the options price. Apple Computer, PriceLine, Goldman Sachs, Master Card are just a few of the many stocks which offer stock options with notable options price swings week after week. Options Data Mine delivers users the tools to data mine for option contracts. ______________ Historical options data combined with options volume data offers traders the most valuable tools to find active and attractive stock options. Data is filtered to weed out the most notable stock options to form a top list of options which stand out from the rest. see exhibit2. 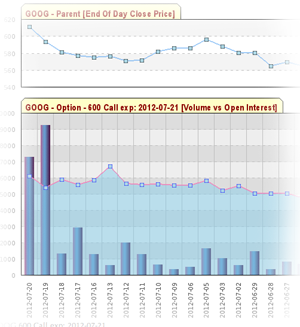 The options volume list focuses in on historical options volume for individual stock options. 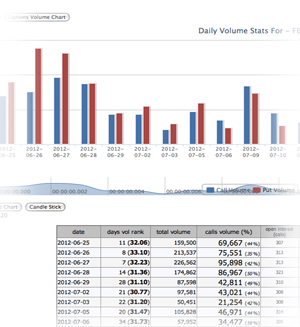 Daily volume analysis is available in a top list format to let users focus on the right options contracts at the right time. _____________ Easily navigate through stocks with heavy options volume, broken down in chart and table format. Volume and historical price data is available for 2 years (additional data is available to subscirbers upon request). The Volume analysis tool gives members the ability to look back and observe volume spikes of the past and the stock options price behavior which followed. Volume analysis is a valuable tool to better understand stock options behavior. 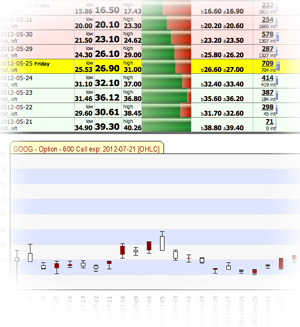 _____________ Options Data Mine data analysis tools lets you create a track list to stay on top of your stock option contracts and their behavior. Utilizing the Watch List gives members a simple tool to follow stock option the price movement without risking capital. With no software to install no large files to download, Options Data Mine is the perfect refrence library of historical stock options data for Stock Traders, Day Traders and Options Traders.